Reads & Feeds – Just a small town girl, living in a library world. There’s something about a great historical fiction novel that gives me all the feels. A novel that then has me scouring the internet to learn more about history often proves to be one that I fall in love with quickly. Next Year in Havana by Chanel Cleeton is one of those novels. I was enchanted by the idea of reading something set in Cuba since, as an American, we know of Cuban culture through the Cuban-American population, not from being able, until recently, to travel to the country itself. Cleeton uses a split narrative to share the lives of her two main characters, Elisa and Marisal. Elisa’s plot line is set against a background of Cuba in 1958, before the Cuban Revolution fully took off. I found myself putting down the novel every 10 pages or so in order to read more about the Cuban Revolution. Marisal’s story line is set in present day as she visits Cuba for the first time to spread her grandmother’s ashes and learn more about the place her family originated. Cleeton’s descriptions of the landscape were enchanting, but what really drew me in, like in most stories, was the discussion of the food. When Marisal arrives in Cuba, she stays with her grandmother’s long-time friend. The friend, with her family, runs a restaurant out of their home, for Cubans and tourists, serving just a few basic items from the Cuban menu, but done to perfection. The first night Marisal stays with her host family she is served lechón asado, black beans and rice, and maduros. In order to recreate this for Reads & Feeds, I scoured half a dozen Cuban cookbooks, made a pitcher of mojitos, and invited some people over for a Cuban dinner party. I adapted some recipes and deep-fried tostones instead of serving maduros. I also made a ceviche, not mentioned in Next Year in Havana, that I am definitely going to whip up again. I hope you enjoy these pictures and recipe adaptations. Share your own Cuban dinner party with me if you recreate this menu! Tag me @chelseatuthill and use #readsandfeeds on Instagram. Happy reading and eating, folks! Lightly muddle the quartered lime and mint leaves with the simple syrup in a glass. Add ice and rum and top with Lime Le Croix. Garnish with mint spring and lime wedge. This can easily be modified, as I did, to make a pitcher for the party. Just be sure not to add the bubbly until you serve. Ideally, pour the mint/lime/rum mixture over ice and top with Le Croix. Placed cubed, raw shrimp in a mixing bowl. Add the lime juice, club soda, sugar, salt, pepper, and rum. Evenly coat the shrimp. Cover and refrigerate for at least 30-40 minutes to allow the fish to marinate and partially cook in the lime juice. Stir the shrimp about every 10 minutes to evenly marinate. When the shrimp is close to being “cooked through,” (it will be pink as though you cooked it with heat), add the rest of the ceviche ingredients and toss to combine the flavors. Taste and adjust the seasoning to your liking. Re-cover the bowl and return to the refrigerator for another 10 minutes. Remove the ceviche from the refrigerator, taste, season with salt and pepper, garnish with mint. Serve with tortilla chips to dip or in individual serving bowls with freshly popped salty popcorn! Combine the garlic, egg, lime juice, salt and pepper in a food processor, blender, or use an immersion blender and puree. Add the oil in a slow stream and continue to process until the mixture has formed a thick emulsion. Deep fry or pan fry in an inch of oil frozen tostones until golden brown. You could make your own tostones fresh if you’re so inclined and not making four other complicated dishes for your guests! I cheated and went frozen and they were delicious. Salt tostones when they come out of the fryer and serve with garlic aioli for dipping. For the marinade I “cheated” and bought Mojo Criollo Sauce from my local grocery store made by Goya. I don’t regret a thing because it came out just as good as I could have made it myself. The following day, about six hours before dinner time, preheat your oven to 250°. Let the meat come to room temperature. Place pork shoulder in roasting pan, skin-side up and pour marinade around the meat. Cover with aluminum foil and place in the oven. Cook for 4-5 hours. The meat should reach an internal temperature of 170° to 190° near the bone, should shred easily, and the juice should run clear when pierced. When it has reached the required temperature, remove from the oven and let rest for 15-20 minutes. Carve into chunks and serve with Mojo Criollo sauce poured over the top alongside rice and black beans. Place dry beans in a colander and rinse under cold water. Transfer beans to a large pot, cover them with the water, and soak for at least 8 hours. They can be left right on the counter covered with a pot lid. This can be done the night before when you set the meat to marinade. Day of the dinner, add the green pepper, garlic, and onion to the pot and bring to a boil. Lower the heat to medium, cover, and cook the beans until they are tender, about 1 hour. Skim the foam from the top of the pot periodically. While the beans are cooking, heat the olive oil over medium heat in a large, heavy skillet. Sauté the onions and green pepper until the onions are translucent, about 3 minutes. Stir in the garlic, salt, pepper, cumin, and oregano and cook for 2 more minutes. Remove half of this mixture, called sofrito, and place in a food processor. Add a large ladle of cooked beans to the food processor, as well. Pulse until well puréed. Stir the puree, remaining sofrito , bay leaf, and sugar into the beans. Bring to a boil again, lower the heat, and simmer, uncovered, until the cooking liquid has the consistency of thick gravy. Stir frequently to avoid sticking to the bottom of the pot. Just before serving, remove bay leaf, stir in white wine vinegar and drizzle in a little more olive oil. Serve with your favorite fluffy white rice. I am overwhelmed, in a happy way, every summer when newspapers, bookstores, and websites publish their summer reading lists of what they think are the next hot summer books of the year. Instead of sharing what I think are the new smash hits, I am going to share a short list of books with you that I have very vivid memories of reading during summertime and encourage you to give them a try! No spoilers here. 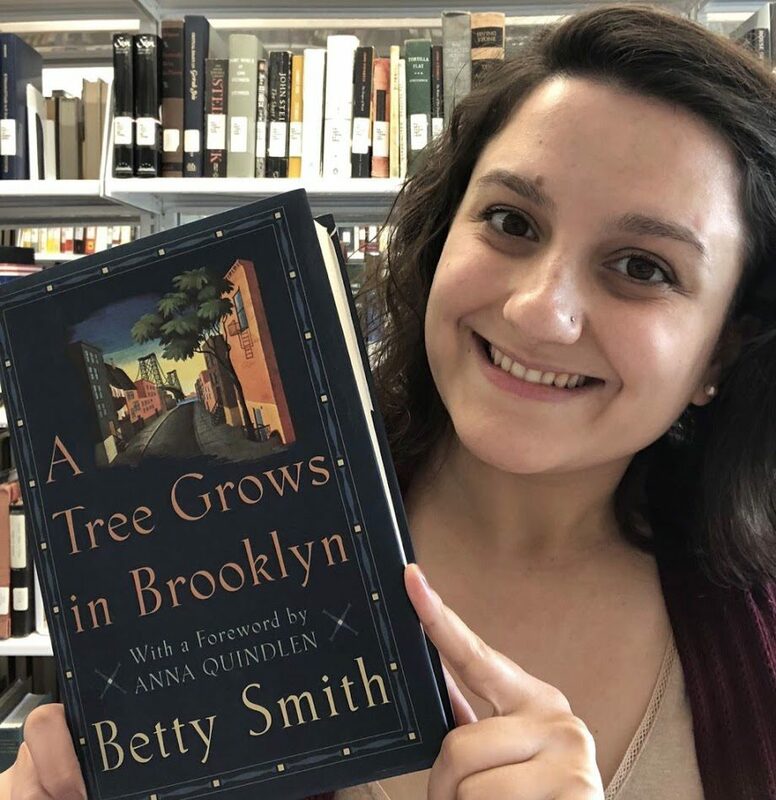 A Tree Grows in Brooklyn by Betty Smith. I read this book one summer during high school after my mom had encouraged me to read it for…oh I don’t know…about four years, at least. I felt so deeply connected to the main character, Francie, and it was one of the first times I remember reading a novel that evoked strong emotions in me that I, to this day, don’t know how to describe. The School of Essential Ingredients by Erica Bauermeister. I ran across this book one summer in college when I did one of my big library hauls, aka, check out 25 books, stack them next to my bed, read three, return the rest unread (the public librarians LOVE me, ha!). The story centers around a local cooking school for home chefs and each chapter is devoted to a different student who attends the classes. This novel made me feel so in touch with each character even though you only get them for one chapter. I thought it was so amazing, in fact, that when it came time to do my senior thesis where I discussed elements that a novel should incorporate to draw the reader in, it was this book that I thought of the entire time. Kitchens of the Great Midwest by J. Ryan Stradal. Some of my favorite books were recommended to me or given to me by my mom (see this one, #1, #5, and Bonus). I got this for my 26th birthday and devoured it while on vacation. This is another novel where the points of view shift to different characters while centered on a “restaurant.” There are also recipes included. What more could you want? Give a Girl a Knife by Amy Thielen. This memoir is about how Thielen grew up in the Midwest, lived the New York City dream in her 20s, and eventually returned to her Minnesota roots to a literal homestead. I couldn’t get enough of her story and her writing. The majority of her memoir relates to being in the kitchen, professionally and personally, and how important a role it has had on every aspect of her life. It made me want to walk barefoot through a garden, cook outside, and share giant meals with all my friends and family in one place. This is an excellent read no matter what the season, but give it a go this summer! If you love it, she has a cookbook and used to have a Food Network show that I’m sure you could dig up! Her Instagram is also lovely. Bonus: Harry Potter by J.K. Rowling. This wouldn’t be a summer reading list if I didn’t include this series, but I really just want to share the story of how I discovered good ol’ Harry. When I turned nine, my aunt sent me an Amazon gift certificate (an actual piece of paper and shipping took over a week, can you belieeeve?). My mom and I sat at the computer and I told her I wanted all Baby-Sitters Club books. She said, “okay, but let’s see what else there is first.” We picked one Baby-Sitters Club (Mary Anne Saves the Day, in case you were wondering), but then my mom came across Harry Potter and the Chamber of Secrets. “Why don’t we try this one? I read about it and I think you’ll really like it.” So I anxiously awaited the arrival of my BSC book and blew through it. I picked up Harry Potter and thought, “alright, I guess I’ll try this out.” I was immediately sucked in and in love with every aspect of it. I remember staying up through the night reading about the basilisk (sorry, spoiler), absolutely petrified (get it? ), but I couldn’t get enough of it. I’ve been a Potterhead ever since and YES I did read the second book first…we had no idea what this series was back in the day! I have a million more book recommendations to make, but too many at once can be too much, and then I leave little room for more suggestions in the future!